DAF Trucks N.V. is a wholly owned subsidiary of the US company PACCAR Inc. In addition to the marketing, development and production of medium and heavy trucks, DAF also manufactures components for third parties. These include, for example, axles and complete engines for buses as well as special vehicles. All vehicles leaving DAF Trucks plants are manufactured according to the customer's wishes. The production facilities of DAF Trucks are located in the Netherlands, Belgium and Brazil. The DAF LF Trucks are the successors of the DAF 45/55 series. They are built since 2001 for urban and regional distribution. Due to the versatility of this truck class, different wheelbases, payloads and engine variants are available to the customer for the LF 45 (6 to 12 tonnes gross vehicle weight) and LF 55 (13 to 18 tonnes total weight) model series. The current DAF LF trucks can be equipped with a wheelbase of up to 6.90 meters. In order to fully utilize the loading volume, body lengths of more than 9 meters are available. The new LF is available in more variations than before. The engines are all from the parent company PACCAR and make depending on the model 115 - 239 kW (156 - 325 hp). The built-in PX engines offer a compact design and the integration of multiple components in the engine block or the cylinder head, they run quieter and thus offer the driver more comfort. Furthermore, the engines meet the latest emission standards. Thanks to the robust construction of the engine block and the cylinder head, the DAF LF can depend on the application, achieve maintenance intervals of up to 60,000 kilometers. DAF CF Trucks have been manufactured since 2005 for a wide range of applications. DAF itself speaks of the best all-round truck. They are used, for example, in distribution, long-distance transport and bulk or tank transport. 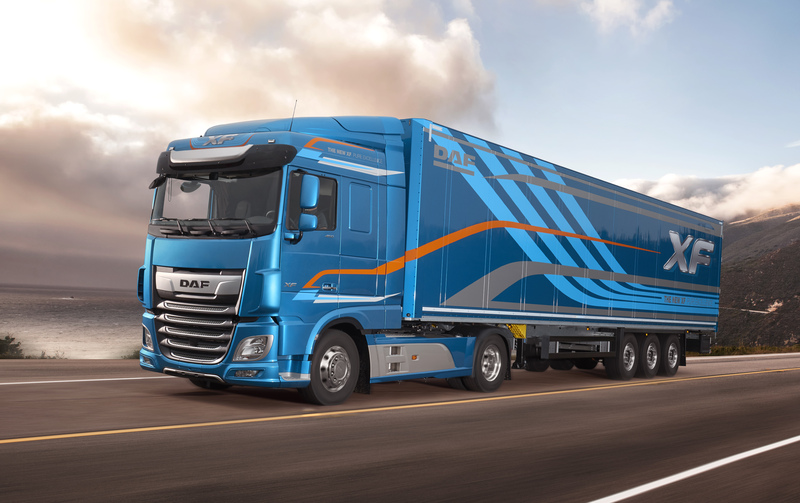 The latest series of DAF CF Trucks are set to go a long way in terms of reliability, efficiency and driving comfort. Weight savings of up to 100 kg provide for a corresponding increase in payload, which is quite positive, especially in the distribution traffic. The DAF CF Truck is known for its reliability. A new electrical and electronic architecture provides for the new series for an increase in performance. Furthermore, all wires, cables etc. have been optimized with the aim of highest reliability. The maintenance intervals of the current DAF CF Trucks are 200,000 kilometers, which indicates maximum uptime. 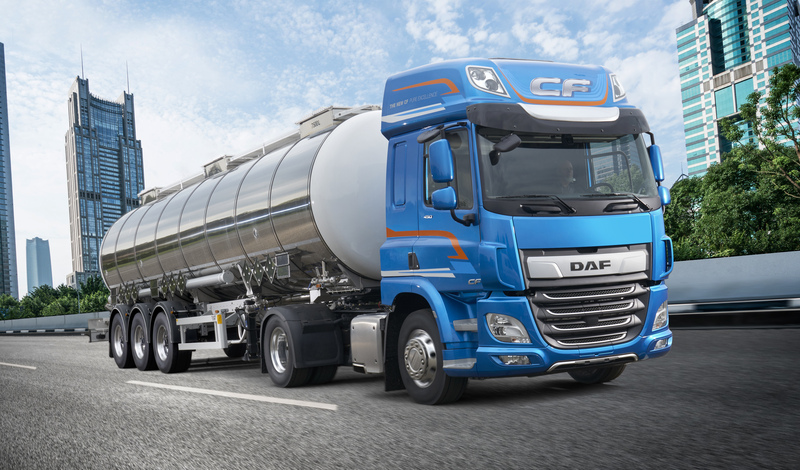 Modern technology also provides up to 7% less fuel consumption and lower CO2 emissions in the new DAF CF Trucks. The DAF CF is also well positioned in terms of design. Whether inside the cabin or outside on the bumpers, sun visors, etc., everywhere value is placed on a high-quality appearance of the truck. The DAF XF is the successor of the DAF 105 XF and is produced since 2013. It is the latest XF truck from DAF. The New XF convinces above all by its fuel efficiency. Its consumption values ​​are industry-leading. Furthermore, as with the CF series, the vehicle weight has been reduced, thus increasing the payload. The XF Tucks are already considered to be quite reliable, but with an optimized electrical and electronic architecture, this DAF series is even more powerful. In the course of this optimization cables and wires were shortened and simplified. This ensures, among other things, an increase in operating times. The New XF scores with maintenance intervals of 200,000 kilometers. But the driver comfort was further increased. DAF states that the XF sets new standards in this area. With numerous equipment options, the cab should be even more comfortable to set up and thus offer the driver a more pleasant workspace. The DAF XF is available with four different engines that power the truck from 315 kW (428 hp) to 390 kW (530 hp). They all meet the requirements for Euro 6. The DAF XF can be equipped with 7 different chassis (4 x 2 to 8 x 4), of which 4 are also available as a low deck version, and 8 different tractor units (4 x 2 to 8 x 4), one out of them is also available as a low deck version. Last but not least, there are two options for the cabin of the XF; the Space Cab or the Super Space Cab.